his is an important interview given by Prachanda on the eve of major May First actions in Kathmandu, the capital of Nepal. It focuses on long range revolutionary goals, the transitional demands of this moment, and the intentions of his party, the Unified Communist Party of Nepal (Maoist). New Democratic: the first step of socialism rooted in revolutionary distribution of land and the severing of foreign control of culture, politics and industry. Federal: meaning that previously oppressed nationalities and ethnic groups have radical new forms of autonomy and self-determination, within an overall “federal” framework of a liberated New Nepal. Republic: meaning the king is overthrown and will not be back, and that his former royal army is required to submit to the changes wanted by the people and their new government. The Interview was first published in the party’s international journal Maoist Information Bulletin (Vol. 04, No. 13) . Prachanda: It is quite clear that the current transitional political situation is very sensitive and delicate. The ongoing peace process and the process of drafting a new constitution are in a critical situation. The domestic and foreign reactionary and regressive elements are continuously conspiring against the aspiration of the people’s peace and constitution. The following first appeared on jedbrandt.net. Jed’s other Kasama posts appear here. 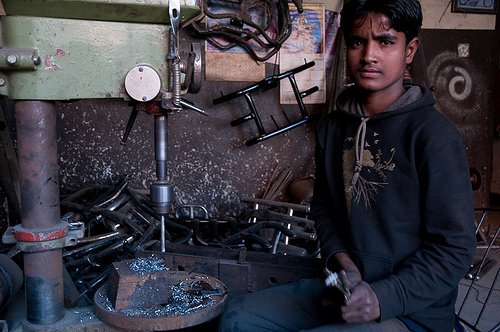 The workshops of Kathmandu’s broken-down trolley system are not far from the airport. The roar of jet engines flying low on approach contrasts with the strange silence of the idle repair barns. Working men play cards beside the rusting hulks of street cars, partially dismantled, piles of machine parts laid along the zinc-sheet walls waiting for resurrection. Some street cars were torched during bandhs shutdowns. None have left the shop in years. The only bustle is around the union office. Workers were fixing up the central room, while a few dozen machinists sat clustered in the building’s shade, eating lentils and rice. Electrical load-shedding blackouts have crippled the electrical system constantly for three years now, so the trolleys can’t leave their barn. Now the yards provide their sporadic electricity output to charge up battery-converted tuk-tuks – a fleet of three-wheel minivans that are now the scrappy backbone of the city’s chaotic mass transportation. He was excited when I mentioned I had worked for a transportation union in the United States. Yesterday, the Unified Communist Party of Nepal (Maoist) called for an indefinite general strike starting May 2, should the current Prime Minister not step aside in the face of the May First mass mobilization.Sector by sector, business as usual is coming to a halt. While rumors shoot around the city, the mood is uncertain. Only the Maoists have a resolution in mind, and only they are bringing the population into action. Their morale appears high, and they are busy. Families from the whole country are being urged to send at least one person to Kathmandu. The parliamentary parties allege coercion, but there have been no reports of violence against those who choose not to attend. 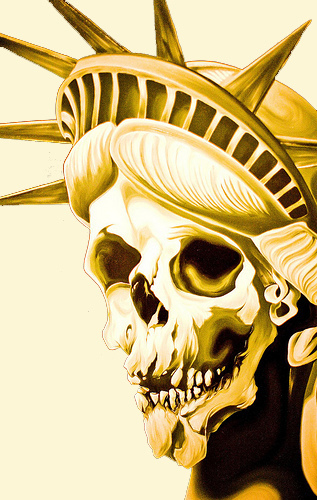 The Arrogance of Empire: U.S. to Judge Nepali Maoists? The following is a transcript of the press conference yesterday in Kathmandu by Robert O. Blake, Jr. Assistant U.S. Secretary of State, Bureau of South and Central Asian Affairs. It is from the U.S. State Department website. We hope it is not necessary to say that the views represented here are not ours. Rather they represent the arrogance of an empire that thinks it can dictate how the Nepali people should run their society — and even conduct themselves in street protests. We present it here as evidence of both the seriousness with which U.S. ruling circles are taking the impending May Day demonstrations. Also interesting is the suggestion that the Maoists closed the private schools in order that they might be used to house demonstrators coming into Kathmandu from the countryside. 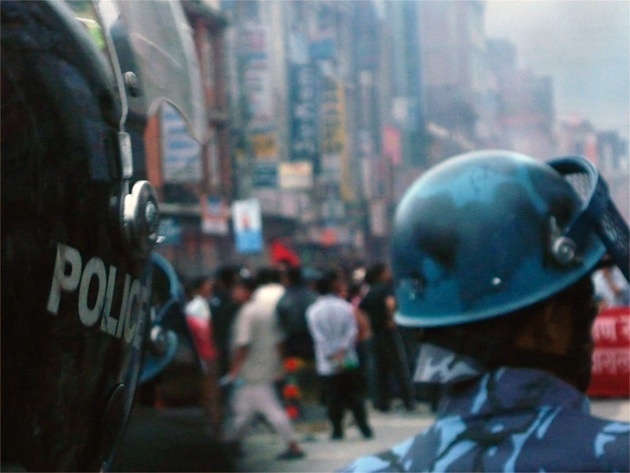 The following is BBC coverage of the growing confrontation in Nepal. If and when these events start to be “handled” and broadcast by the official world media (and as anti-revolutionary narratives start to shape perceptions) our tasks and situation will change — in good ways and bad. 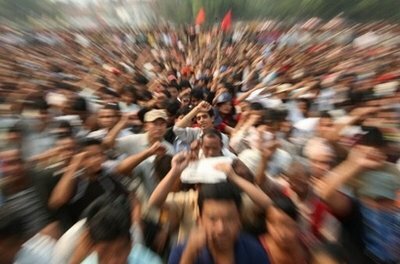 There will inevitably be more developed questions and backward views on Nepal among the people, and there will be more interest (among many) to hear a communist analysis of the movement and its goals. 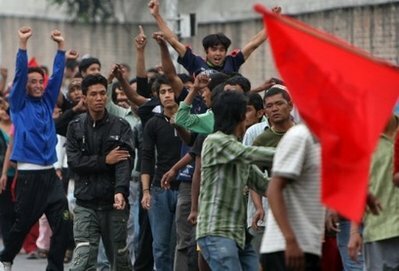 Thousands of Maoists have converged on the Nepalese capital, Kathmandu, ahead of a planned May Day rally on Saturday. Members of the Maoist youth wing as well as ordinary supporters are camping in hundreds of private schools that they shut down last week. Maoist leaders insist that Saturday’s demonstration will be against the government and will be non-violent. However, tension is mounting in the capital where the security forces have been put on high-alert. On Monday Maoist leader Prachanda urged the public to support the nationwide street protest aimed at toppling the current government. He said Saturday’s protest – to be followed by a general strike – would be a massive but peaceful show of popular will. Beneath Everest is a new documentary film depicting the revolution in Nepal. While containing some interesting footage and criticisms of the Nepalese monarchy, this film is an obnoxious, arrogant attack from a western liberal perspective on the oppressed of Nepal and their revolution. Shortly after this opening scene, we see an interview with Kapil Shrestha (identified only as “professor of political science,” yet having more interview time than any person actually involved in the revolution). Shrestha tells the viewer, “Until very recently, Nepal was known as a very peaceful, beautiful country populated by smiling faces. But this is no longer so.” This excerpt is followed by the film’s “exploration” of Maoist violence. May First — International Workers Day — is a moment for us all to strengthen the revolutionary solidarity and common struggle of the oppressed people of the world. It is particularly telling this year that great outrages have been carried out against immigrant people in these days just before May First. And that in South Asia, May First has become the focus of a major test of strength, as a great crisis grips the old order in Nepal. 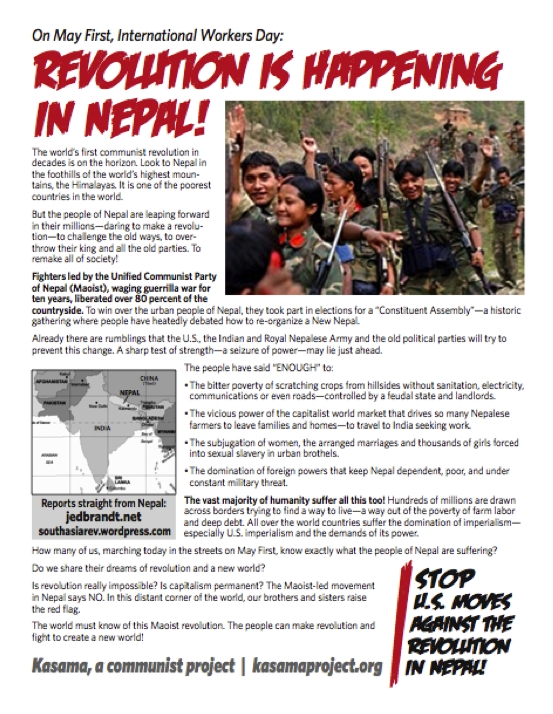 Here are copies of the Kasama Project’s leaflet for this May First 2010 — helping more people know about the revolutionary crisis and communist efforts in Nepal — and deepen the connections and internationalist understanding between the working people worldwide. The leaflet is designed to be two-sided (one side Spanish, the other side English). And it is available in both color and black-and-white. The following is a report from Nepal, first posted on jedbrandt.net. Jed Brandt’s previous reports, photos and writings are also available here on Kasama. KATHMANDU April 25 — Revolutionary students allied with the Maoists today shut down 8,000 private school across Nepal demanding fee hikes be immediately withdrawn. Business offices were padlocked at major schools last week. When negotiations between the student union and school owners broke down, several buses were torched. As of today, an indefinite closure was ordered as Nepal approaches the Maoist decisive May First mobilization. What is a Bandh in South Asia? As the revolutionary movements of South Asia grab more and more attention — the word bandh is appearing. There are currently a number of major bandhs going on in Nepal — led by Maoist forces — including a new bandh of students shutting down thousands of schools in support of the revolutionary movement. Bandh is the word used in South Asia for political shutdowns (of whole areas, neighborhoods, factories or sometimes schools). But what exactly is a bandh? Sometimes it is translated “general strike” — which has led to some confusing debates among forces who have very particular ideas about “general strikes” (and how they should be conducted). Other times, it has been seen through the prism of north American experience (with particular kinds of formalized strikes of trade unions and workers).